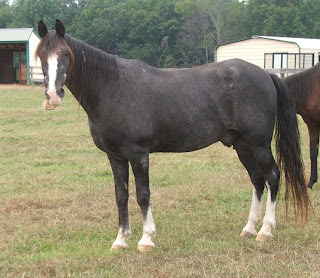 For more senior horses needing homes, click on the "needs home" tag following this post. This is a listing service only. Traveller's Rest can not guarantee the accuracy of information provided in "needs home" entries. 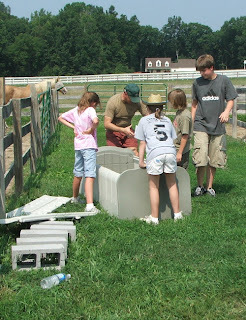 to White Bird Appaloosa Horse Rescue following the loss of a very special resident, an Elder mare named Heather. 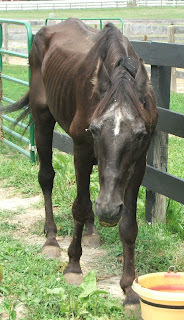 Honest Abe is a mid-20's Quarter Cross (TB or Standardbred) that is in immediate need of a warm rehabilitation home. Abe is a kid friendly, well broke (Amish) horse with years of service under his belt. 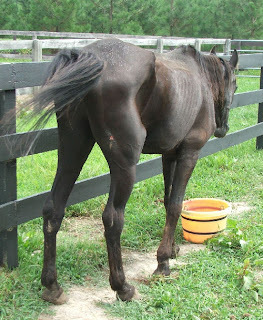 Abe has had his teeth floated, is current on wormer and hoof care, but will need a coggins and fall shots soon. (Shots and Coggins were up to date when moved to this facility.) Abe is about a 2.5 on the Henneke scale, locate near Rochester, MN, and is looking for an immediate care placement. Emma! Jeb took one look at the newest arrival and decided he has a reason to hang around a while longer. 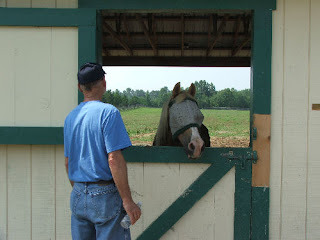 "...............and they lived happily ever after..........."
Do you feed Triple Crown, Reliance,or Legends products? The following was written in August 1990 and quickly circulated through Fort Hood, home of the First Cavalry Division, just prior to Desert Shield/Desert Storm. the the security of "home" with him will be lost. when called to do so. in a land where there is no penalty attached to freedom. to really believe in America. Because I am proud to be the wife of an American soldier! 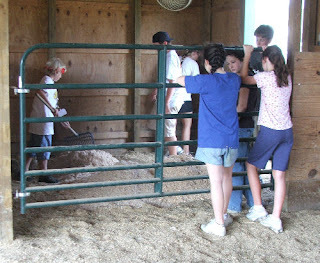 Please stop by the Traveller's Rest Equine Elders Sanctuary table and say "Hello" this weekend at the Virginia Dressage Association, Fredericksburg & Charlottesville Chapters' shows at Rose Mount on Courthouse Road (Rt 208) in Spotsylvania. Schooling Show Friday, September 14th! Not exactly (for one thing, this young man is a gelding!) Meet one of Traveller's Rest's recent newcomers. Meet Rienzi, the horse whose welcome was a result of hard work by the Fredericksburg United Methodist Church's Vacation Bible School last month. It is obvious that Rienzi needs to gain more than a few pounds. What is not obvious, at first glance, is his dental condition. Rienzi's "underbite," sometimes called "monkey mouth," is probably congenital. He's dealt with it his entire life. 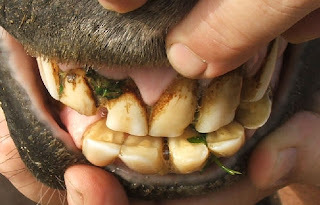 In recent years, however, it is likely that the abnormality was too much too handle on top of the uneven wear patterns so common in elder equine teeth. The way Rienzi's teeth wore literally made is impossible for him to move his jaws in a normal chewing pattern. 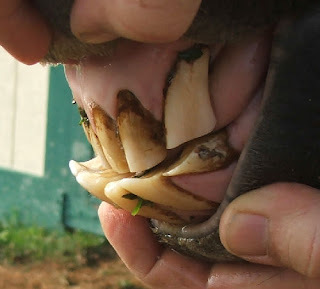 Since arrival, Rienzi has had a little dental work done, reducing the length of a few overly long teeth, especially those lower incisors (front teeth.) 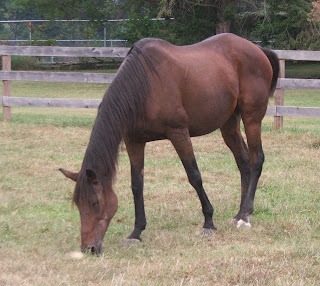 While his molars are so worn that he will never chew grass or hay normally again, he is once again able to eat comfortably. Rienzi is currently eating four meals of mush (soaked senior feed) each day. During the next week, we will add soaked grass/alfalfa cubes to his diet to see if that is a viable way to meet his roughage requirements. In addition to his dental issues Rienzi has another, perhaps more serious, problem. Two veterinarians, on different occasions, diagnosed Rienzi with neurological deficits due to compression on the spinal cord in his neck, most likely a result of arthritic changes to his vertebrae. This condition is not correctible so we don't, at this time, know what the prognosis might be. The immediate plan of treatment is to put some weight on our little friend, try to build some muscle in his handquarters and see if that improves his balance. He will never again be a riding horse, but he will have a home here as long as he is comfortable and can be kept safe from injury. We chose the name "Rienzi" in honor of the General Phillip Sheridan's great mount (renamed "Winchester" following his famous ride.) If there were ever an equine athletic standard to which a horse might aspire, the nineteenth century "Rienzi" set that standard. In Sheridan's words, Rienzi was "an animal of great intelligence and immense strength and endurance. He always held his head high, and by the quickness of his movements gave many persons the idea that he was exceedingly impetuous. This was not so, for I could at any time control him by a firm hand and a few words, and he was as cool and quiet under fire as one of my soldiers. I doubt if his superior as a horse for field service was ever ridden by any one." Up from the South, at break of day,Bringing to Winchester fresh dismay,The affrighted air with a shudder bore,Like a herald in haste to the chieftain's door,The terrible grumble, and rumble, and roar,Telling the battle was on once more,And Sheridan twenty miles away. And wider still those billows of warThundered along the horizon's bar;And louder yet into Winchester rolledThe roar of that red sea uncontrolled,Making the blood of the listener cold,As he thought of the stake in that fiery fray,With Sheridan twenty miles away. But there is a road from Winchester town,A good, broad highway leading down:And there, through the flush of the morning light,A steed as black as the steeds of nightWas seen to pass, as with eagle flight;As if he knew the terrible need,He stretched away with his utmost speed.Hills rose and fell, but his heart was gay,With Sheridan fifteen miles away. Still sprang from those swift hoofs, thundering south,The dust like smoke from the cannon's mouth,Or the trail of a comet, sweeping faster and faster,Foreboding to traitors the doom of disaster.The heart of the steed and the heart of the masterWere beating like prisoners assaulting their walls,Impatient to be where the battle-field calls;Every nerve of the charger was strained to full play,With Sheridan only ten miles away. Under his spurning feet, the roadLike an arrowy Alpine river flowed,And the landscape sped away behindLike an ocean flying before the wind;And the steed, like a barque fed with furnace ire,Swept on, with his wild eye full of fire;But, lo! he is nearing his heart's desire;He is snuffing the smoke of the roaring fray,With Sheridan only five miles away. The first that the general saw were the groupsOf stragglers, and then the retreating troops;What was to be done? what to do?--a glance told him both.Then striking his spurs with a terrible oath,He dashed down the line, 'mid a storm of huzzas,And the wave of retreat checked its course there, becauseThe sight of the master compelled it to pause.With foam and with dust the black charger was gray;By the flash of his eye, and his red nostril's play,He seemed to the whole great army to say:"I have brought you Sheridan all the wayFrom Winchester down to save the day. "Hurrah! hurrah for Sheridan!Hurrah! hurrah for horse and man!And when their statues are placed on highUnder the dome of the Union sky,The American soldier's Temple of Fame,There, with the glorious general's name,Be it said, in letters both bold and bright:"Here is the steed that saved the dayBy carrying Sheridan into the fight,From Winchester--twenty miles away!" After several weeks of an information drought, we have a plethora of updates to post in the next few days! Since our last update, one of the most productive mornings in the short history of Traveller's Rest occurred on August 8th. The Cavalry arrived in Spotsylvania Courthouse once again! 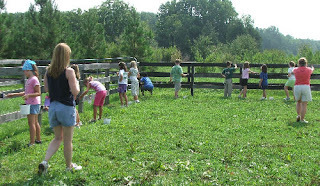 We were expecting a new horse to arrive, and the Fredericksburg United Methodist Church's Vacation Bible School (fourth and fifth grade class) took over the job of preparing the accomodations. Thank you, FUMC VBS! You accomplished, in one morning, what would normally take 2 or 3 days. You're welcome any time!